The eyewear collection at In Focus Eye Center has been hand-selected for patients who have high standards and great taste. The pieces we've chosen have a creative and fashionable edge while maintaining an everyday-wear sensibility. Having ultra violet protection for your eyes is as important as sun screen for your skin. The best sunglasses are the ones that pull double duty by protecting your eyes and helping you look your best. Glasses lenses are a technology based item with new products and improvements being introduced all the time. 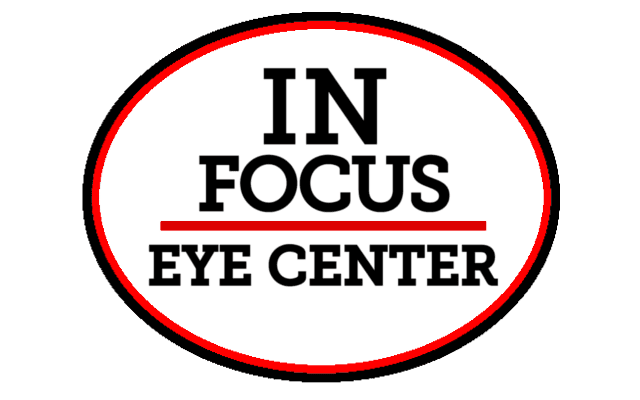 At In Focus Eye Center we make suggestions based on the needs of your lifestyle. Contact lenses do not need to make your eyes tired, dry or irritated. Many people make the assumption that these symptoms are the price of wearing contact lenses, when in fact contacts that fit well tend to be comfortable from morning to night. This is how design makes a difference. embraces chic femininity with whimsical and sophisticated designs. Fashion-forward designs that combine European sophistication with true American spirit. Contemporary, classic and athletic styles in innovative materials. When lenses are made, they are polished make them transparent and clear. But polishing creates reflections that often create glare and ghost images. If you have ever seen faint images around streetlights at night, you have seen the effects of these reflections. Reflections are more than nuisance; they also can decrease the amount of light passing through a lens and can decrease the clarity of vision through the lens. This is more easily noticed while viewing computer screens and driving at night. If light does not reflect off a lens, it goes through it. This is how anti-reflective coatings work. Decreasing the reflections make it easier to see and easier for others to see you. There are many types of anti-reflective coatings available. Some of the newer types even have the ability to resist smudges and dust. They are also available in color-free designs. For many people, different lenses are needed for seeing at different distances. Bifocal lenses allow the wearer to look through two areas of the lens. The top area focuses on distant objects and a "D"-shaped area allows for reading. One of the most common issues with this lens style is the image jump associated with the transition from the top to the bottom of the lens. Bifocals were invented by Benjamin Franklin and while the technology was revolutionary at the time, we have much better options available today in the form of Progressive, or no-line lenses. Progressives provide a smooth transition from focusing on distant objects to focusing on near objects because they do not have a distinct line which separates the focusing powers. Instead, a gradual change in power allows the wearer to focus on objects at all distances. Distant objects are viewed through the upper portion of the lens, while near objects are viewed through the middle or lower portion of the lens. Progressives first became available around 1960. The designs were crude but did allow a gradual change from distant vision to near vision. Since those early designs, there have been many different progressive lenses to hit the market, each with different levels of clarity, comfort and distortion. For this reason, it is important to realize that not every progressive is the same -- some are much easier to use than others. In 2009 there were more than 400 different types of progressive lenses on the market and some of those were same lens designs available in the 1960s. An exciting development to progressives in recent years is the advent of Free-Form progressives. These lenses use computer-aided designs to optimize vision depending on the prescription, lens size, intended usage and many other factors. These lense designs are the the closest to natural vision that progressives have ever been. If you have ever had difficulty with progressives, Free-Form designs may help you feel more comfortable, especially when viewing a computer screen. Glare from wet roads, a dashboard or reflecting off other vehicles can be annoying and very dangerous. Eliminating this glare can greatly increase visibility and decrease eye strain. The best way to do this is with polarized lenses. We all use our eyes differently from others. The two most significant aspects determining how a lens will work for our needs boils down to the distance and height at which we are looking. If you spend and significant time looking at an odd distance or height, a specialty lens may make your life a lot easier. A common need for a specialty lens involves computer use. Long periods of time on a computer can lead to headache, eye strain, dry eyes, neck/back aches and blurred, or double vision. Computer lenses can provide the correct power at the correct height to alleviate this common trouble. Specialty lenses are not limited to just those two situations. Most visual activities that require long periods of concentration can benefit from tailoring a lens to make the eyes work more efficiently. Since we all use our eyes in unique ways, finding a solution to this problem may be as easy mentioning how you use your eyes to Dr. Chretien during your examination. Years ago, the only materials available for lenses were glass and a hard resin called CR-39. More recently, high index lenses have become available. The term "index" refers to the index of refraction, or a lenses capability to bend light. Basically, high index lenses can do the same job as glass or CR-39 but end up being much thinner and lighter. High index lenses avoid the "Coke bottle" look. This was the first high index plastic. Polycarbonate was originally developed for fighter jet cockpits and has been used in the space program due to it's high resistance to breakage in an impact. Most sports lenses are made of polycarbonate. A common limitation of polycarbonate is a drop in vision clarity and a greater tendency to scratch. Polycarbonate has an index of 1.59. These lenses have an index of refraction greater than glass and plastic. Mid-index lenses are those materials with numbers such as 1.54, 1.56, and 1.57. These lenses are thinner than glass (1.53), and nearly as strong as basic plastic (also called CR-39). High index lenses, such as 1.60, 1.66, 1.67, 1.70, 1.71 and the newest 1.74, are much thinner than glass or CR-39 (1.50). However, higher is not always better when considering lenses. Frame style, cost and prescription all affect which material may work best for you. Talk with our trained optician to decide which high index lens is right for you. If you've ever felt frustrated at needing prescription glasses and prescription sunglasses to accommodate an outdoor lifestyle, you should consider photochromic lenses. Photochromic lenses darken when exposed to UV rays. The change is caused by photochromic molecules that are found throughout the lens or in a coating on the front of the lens. These lenses darken when outside and become clear when back indoors. There are a variety of photochromic options available, with choices in color and darkness of tint. However, photochromic lenses do not get quite as dark when driving in a car or when it is hot out. Plastic lenses are more susceptible to scratches than glass. Scratches damage the cosmetic look of the lenses as well as their performance. With a scratch resistant coating, you don't have to worry so much about minor scratches on your lenses. However, it is important to remember that scratch resistant does not mean scratch-proof. All lenses are susceptible to scratches if they are not cared for properly. Bifocals allow the wearer to read through one area of the lens, and to focus on distant objects through another area of the lens. But as the eyes age, a stronger prescription is needed to read. As the bifocal power increases, the range of focus with it becomes more shallow, making it difficult to focus on objects at intermediate distances, such as grocery items on a shelf or your speedometer. Thus, trifocals are necessary for a third prescription for intermediate focusing. Trifocals, also known as lined trifocals, feature three areas of focusing power, each separated from the other by a distinct line. The three windows allow for focusing on distant objects, intermediately distanced objects, and for reading. The downside of trifocals is dealing with the lines between the different focusing powers and the jump of the image over the lines. The advantage of this design is that the intermediate and near sections are wider than those created in progressive lenses.